SysTools DBX Converter wizard facilitates easy migration from Outlook Express to Outlook 2019, 2016, 2013, 2010, 2007 & so on. It allows to view Outlook Express files in 8+ preview modes to study the anatomy of DBX mailboxes. DBX file to PST converter allows to extract DBX files in multiple format such as EML, MSG and PST file. Moreover, to export DBX to Outlook file, MS Outlook installation is not required. The utility also permits to batch export DBX files in PST file format in a hassle-free way. 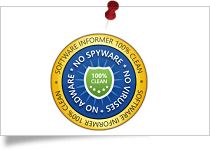 Software Informer gives SysTools DBX file Converter Software 100% secure and fast processing tool to convert dbx to pst. 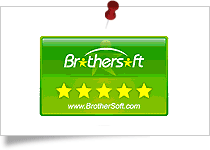 SysTools DBX Export Tool gets 100% clean award by Brothersoft for delivering Ad/Virus/Spyware free solution. 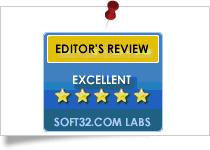 SysTools DBX Converter got the 5 stars rating from Cnet for its efficient working and converting DBX to EML. SysTools DBX to EML, PST, MBOX & MSG File Converter tool is the recommended software among various others as it delivers 100% result with 0% loss of data while importing Outlook Express dbx to Outlook 2019 . When it comes to export Outlook Express DBX files into PST/MBOX/EML/MSG file format then I always recommend Outlook Express Converter. The software is having a user-friendly with numerous features integrated into it. Moreover, I am also impressed with the high-performance of the software. If anyone wants to convert their DBX data files then they must try this amazing utility. After converting DBX files into PST format via DBX to PST Converter, I can say that it is just an easy-to-use and powerful software to convert Outlook Express files into multiple file formats. The tool is capable to convert DBX files in bulk in just a few clicks. Moreover, the utility also provides different preview modes to view DBX files with attachment. I would suggest this versatile software to all the users out there. Mail View: View email normally with details such as date, time, subject, from, to etc. 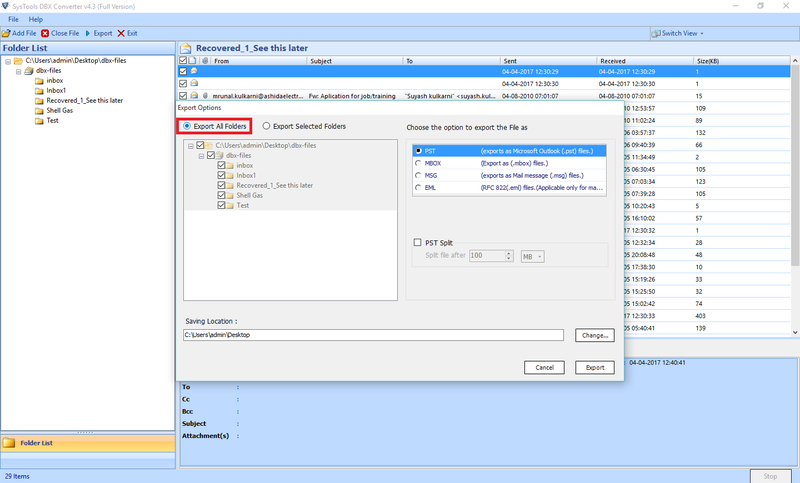 Hex View: View Hex Code of the DBX email via this option. Properties: Preview DBX email with associated properties. Message Header: View the message header of the DBX file. MIME: View non-text attachments such as audio, video, images and other multimedia file present in the DBX email file. Email Hop: View the Email Hop of the DBX email message. HTML: Preview of DBX email in Hyper Text Markup Language (HTML) format. RTF: Preview DBX email in RTF with symbols like #, $ etc. Attachments:View attachments associated with DBX email message with the Attachments preview option. With DBX to PST Converter, one can export multiple Outlook Express files in bulk with Export All Folder and Exported Select Folders options. Export All Folders: This option allows the user to export all the folders containing different DBX files into multiple file formats. With this option, all the DBX files present in the folders are exported at once. Exported Selected Folders: Sometimes, the user needs to export only the required DBX folders. Now, with Outlook Express DBX Converter tool, one can export selected folders with DBX files into different formats such as PST/MBOX/MSG etc. as per the requirements. Are you having IDX and MBX Files and you need to convert them into PST file format? Basically, IDX file format is the identity file format used by Outlook Express for indexing purpose which does not contain any data. It is supported in version below 5.0. On the other hand, the MBX file format is created in Outlook Express version 4.0. The MBX file format is similar to MBOX file format so the user can make use of MBOX Converter to convert MBX files into PST file format. I need to migrate Outlook Express contacts to Outlook? Sometimes, the need arises to move Outlook Express contacts to Outlook. In such a case, the user can make use of WAB Converter. With this utility, the user can easily save Outlook Express contacts WAB file into Outlook Address Book or Excel. Want to convert bulk Outlook Express EML files into Outlook PST file format? Most of the users need to convert Outlook Express EML files into PST file format in bulk. To implement this task, one can rely on EML to PST Converter. This software permits the user to convert EML files into PST file format in bulk without any issue. How to export selected Outlook Express folder into Outlook PST? DBX to PST Converter allows the user to convert selected Outlook Express folder into Outlook. The software provides Export Selected Folder option while the export process. With this option, the user can select the folder which he/she need to export to Outlook PST. I Need to export all the Outlook Express folders into Outlook? The user can easily export all the Outlook Express folder into Outlook file format with the help of Outlook Express Converter. The software is integrated with Export All Folder option which makes hassle-free for users to move all Outlook Express folders to Outlook. Can I view attachments associated with Outlook Express emails? Yes, you can easily open and view Outlook Express emails along with attachments via Outlook Express DBX Converter wizard. The software provides Attachments preview mode which permits the user to view attachments such as documents, PDF, images etc. The user can also save the attachments along with the emails. Add multiple DBX files individually or Add Folder having all DBX files and convert them all in batch. 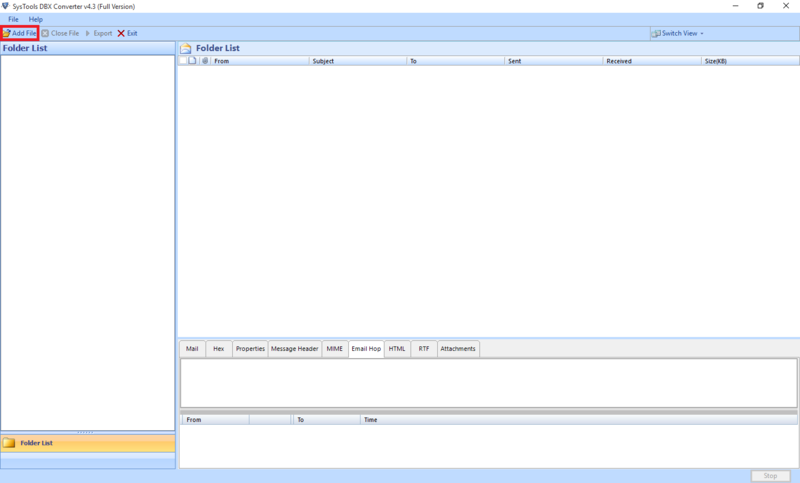 Import DBX to Outlook tool will create single PST file for each DBX file e.g. inbox.dbx to inbox.pst; outbox.dbx to outbox.pst; michael.dbx to michael.pst and like this. Convert and save Outlook Express DBX files to Outlook PST, EML and MSG File format. You can further use these .eml and .msg files on various applications such as Windows Live Mail, SeaMonkey etc.. Export DBX to PST Converter Software scans multiple DBX files simultaneously with proper status report and load all the emails by showing the item count of each folder in DBX file. Outlook Express to PST converter allows to View each email message body of selected DBX file in different views like: Normal view, Hex View, Property view, Email Hop view, Message Header view, Attachments view etc. 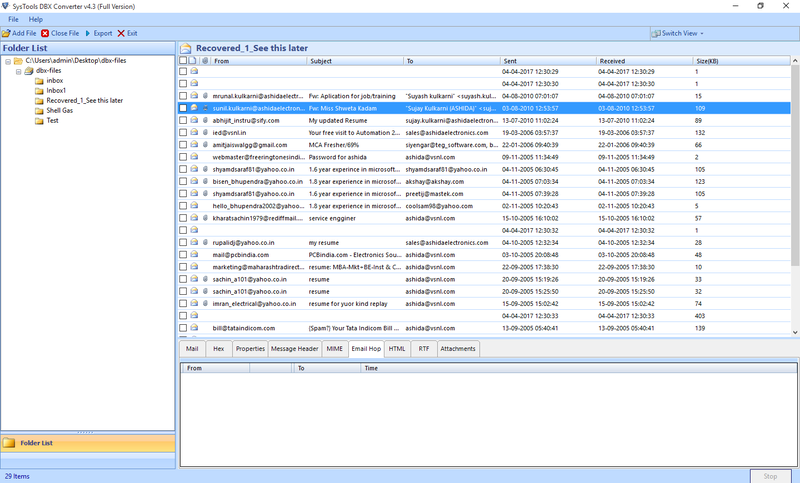 In-built viewer of Migrate DBX to PST utility will show an instant preview of all attachments of the corresponding emails. You can preview attachments like images, documents etc., & cannot save the attachments directly. The tool also known as the DBX to MBOX Converter. With the help of this, you can move to free email client application such Thunderbird, SeaMonkey etc. The folder structure and metadata remain as it is before & after the conversion process. To save the .dbx to .eml and .msg format, you can now select the desirable naming options. You can save the files by subject, date or other combinations while importing Outlook Express DBX to EML, MSG. You can convert and save selective files or folders from DBX to EML, MSG and PST file format by maintaining the folder structure. The Migrate DBX to PST tool will keep the formatting of emails intact after conversion. DBX Converter Tool has an option to save files by creating a new folder directly from software panel. 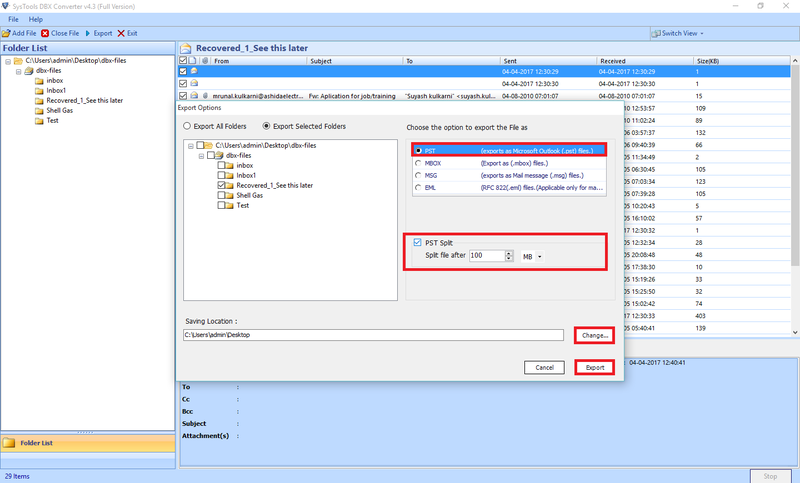 To save DBX files as PST / EML / MSG, instead of selecting existing folder, directly make a new folder & save. If not aware of the storage location for Outlook Express data, you can use the auto detect checkbox provided for automatically detecting the storage location of DBX files within a root folder. 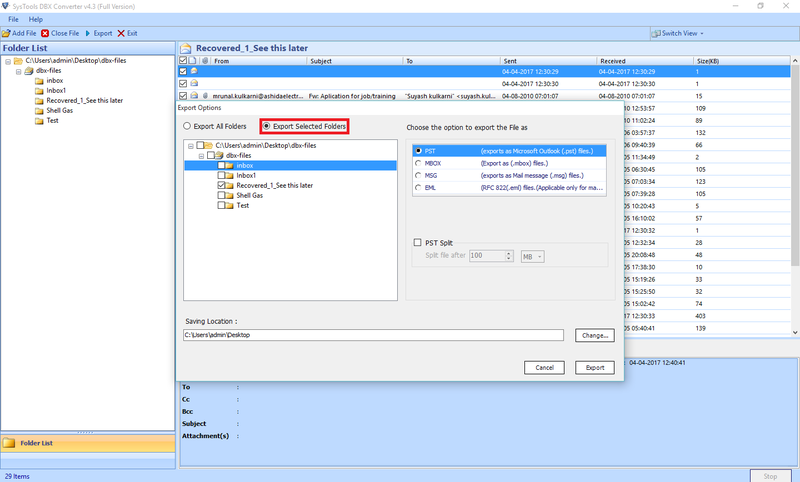 Thus the Outlook Express to Outlook converter will auto locate DBX location when you select a Folder. With help of DBX file converter software, user can import Outlook Express DBX files to Outlook 2019, 2016, 2013, 2010, 2007 with attachments. The Software do not lose formatting while exporting DBX to Outlook, 2019 2016. Once you Convert Outlook Express DBX Files to PST file format. The .dbx to .pst converter grants you an option to split PST file by size upto to 45GB. So, create PST file and divide it by size into smaller parts. Download DBX to PST Converter to Move from OE to MS Outlook 2019. Demo version of DBX Converter Wizard will generate Preview & Export only 25 Items per Folder from DBX to EML / MSG / PST / MBOX. How can I import DBX files from Outlook Express to Outlook using DBX converter Wizard? By Following these simple steps you can import Outlook Express to Outlook 2019 2016, 2013, 2010, 2007 also. 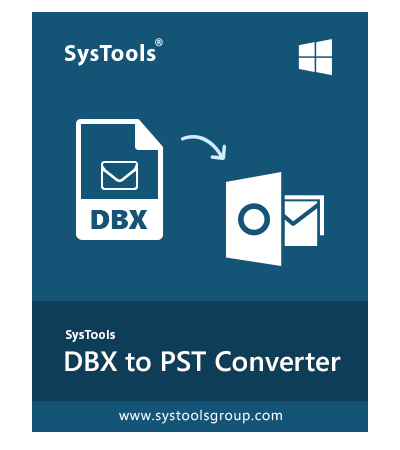 Download SysTools DBX to PST converter full version. Click on Export to start the process. Confirmation of successful transfer of dbx files to pst. Save Export Report of the complete process. Go to location where you have saved the file. Which version of Outlook Express does your software support? Outlook Express Converter tool supports all versions of Outlook Express viz; 4.1, 5.0, 5.01, 5.5 and the current version 6.0 as well. Can Use the DBX file to Outlook PST Converter Software on My Mac OS X? No, DBX Converter software is a Windows based tool and cannot be installed on a Mac machine. You can install it on any Windows machine and perform the respective conversion. If you want, you can import output PST in Outlook Mac later on. I don't have Outlook Installed in my machine? Is Outlook mandatory for conversion? DBX to MSG Converter does not require Outlook installation to import Outlook express DBX file to Outlook PST File. It will not bring any effect to the conversion if you do not have Outlook installed on your machine. DBX Converter still import DBX file to Outlook PST easily. Is bulk file conversion possible to be done with DBX Converter online? I have around 30+ DBX files and want to convert them into PST file format. Should I select one DBX file at a time or is there any other way by to add all those DBX files in one go for conversion? Yes, you can add any number of files at once. You just need to create a folder; copy all DBX files into it and browse that folder on the software to perform bulk file conversion. How Can I Open a PST File If I Don't Have Outlook Installed? To open PST file, Outlook must be installed on your machine and should be configured properly with a valid POP3 or dummy profile. See the steps to install and configure Outlook on your machine. I have an inaccessible DBX file. Can I still convert it using your product? Yes, the export DBX to EML can easily convert DBX file to EML file format in case of an inaccessible DBX file. If the emails are deleted by mistake then you can easily access them again with the help of this software. I Have Upgraded from Windows 8 to Windows 10; Does Your Software Support Windows 10? Yes, the Outlook Express export tool is compatible with Windows 10 and all previous versions of the Windows Operating System. 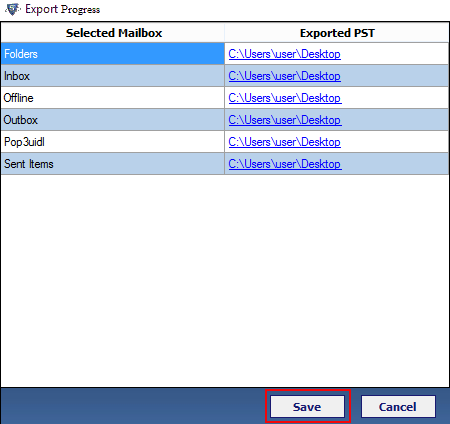 Does software helps me to convert Outlook Express DBX to EML? Yes, you can use DBX to EML converter for smooth and easy conversion of DBX files to EML format. Then after you are able to import resultant EML into Windows Live Mail also. What are limitations of best free DBX File to PST Converter? The Free Demo version of .dbx to.pst converter only allows to convert 25 items per folder to Outlook PST, EML & MSG. I am looking to migrate from Outlook Express to Windows Live Mail. Does your software helps me to do so? Yes, with help of free DBX to EML Converter software you can easily move from Outlook DBX to WLM with complete data. What is difference between DBX to PST Converter open source & proprietary software? Complex user interface means less productivity which will likely costs for more than purchasing full version of .dbx to .pst converter. 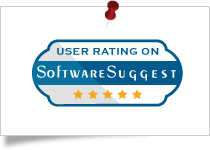 Open source software are very much identical to proprietary software but fails to deliver results with high accuracy. There might be possibility that developer of open source or crack version of software may contain Trojan horse or spyware which will leaks all of your system data. There is no support available for freeware or crack version of DBX export software but with proprietary software you are eligible to get support 24*7 depends on vendor. Is it fair to use online software for the conversion of Outlook Express DBX files to PST? As far the security of data is concerned, we must not use free or online software to convert DBX to PST. This is because possibility of losing data grows exponentially and there is no medium to get it back. So, it advisable to use only safe and efficient software such as dbx converter. Does your Outlook Express keeps crashing? Is Outlook Express unable to show pictures? Click on options in Tools menu and then click on security tab. Does Outlook Express keeps prompting for password? Is Your Outlook Express not responding in Windows XP? Having issue in sending mail from Outlook Express? There may be multiple configuration missteps which lead to halt of your outgoing emails. Follow below mentioned steps to troubleshoot Outlook express. If the issue still exists then its best time to migrate from Outlook Express to Outlook with DBX file converter. How can I move from Outlook Express to WLM Windows 7? The Outlook Express Converter wizard, allows you to easily convert bulk OE mailboxes to multiple file format such as EML, MSG and PST file format with intact meta-data. It also provides multiple naming convention to effectively manage the resultant EML files. Which is the optimal solution to save Outlook Express DBX mailboxes to PST? Yes, It is true that Outlook Express is no longer available and supported by Microsoft. So, OE user can't expect any type of help from customer service provided by Microsoft. But OE user can easily migrate to MS Outlook with the help of DBX Converter wizard. Download now for free trial. Is this software capable to convert DBX files to PST with attachments? “ Previously I had used many software for the conversion of Outlook express database file with attachments. But they only converts email messages." Yes,your query is genuine, some of the software available online claims to provide uncountable number of features but in actual, investing in such software will only consumes time and money as well. So, we have allowed user to download DBX Converter free to try it first. You can also download software free and test it functionality as well. Is bulk file conversion possible to be done with DBX Converter? I have DBX files of size about 25 GB in SSD. I want to access these DBX files in Windows Live Mail on Windows 7 operating system. Can do the same in quick time? Yes,definitely, With folder mode option of Outlook Express Converter software you can easily export 25 GB of DBX files to Windows Live in quick time without losing any data. I have used DBX File to PST Converter for the first time and i am really impressed by its performance. This tool has converted my 57 .dbx files to .pst; just like that and now i have moved all the data from DBX file Outlook completely. Kudos to you guys. The best thing I have observed about this software is its ability to split the large Outlook file by its size. There are many challanges occurs to migrate from Outlook Express to Outlook email client but this tool overcomes all issues in perfect manner. Thanks a ton developers ! I am pretty much satisfied with performance of software. I easily migrate from Outlook Express to Outlook with complete data. Tool is fast, safe, suitable to convert DBX files to Outlook PST without losing any data. I would like to thanks DBX to MSG Converter software to precisely convert DBX to MSG file format with ease. The user interface of the software is so simple and genuine that my 7th standard son easily operate and completed the process of conversion of Outlook Express DBX files. I successfully switched to MS Outlook from OE using this amazing software. It enable me to view DBX files in 8+ file format. My organization was completely depends on Outlook Express for any type of email communication. But recently, we move on to Windows Live Mail with SysTools DBX to PST Converter. The speed and accuracy of the software is excellent.